U.S. Sen. Bob Menendez "sold his office for a lifestyle he couldn't afford" by accepting luxury trips from a wealthy doctor seeking political influence in return, a government prosecutor told jurors Wednesday during opening statements of the Democrat's corruption trial. Menendez, New Jersey's senior U.S. senator, later lied about the trips on Senate disclosure forms, Justice Department attorney Peter Koski said as he laid out the government's case against Menendez and the doctor, Florida ophthalmologist Salomon Melgen. "Make no mistake, Sen. Menendez was Solomon Melgen's personal United States senator," Koski said. 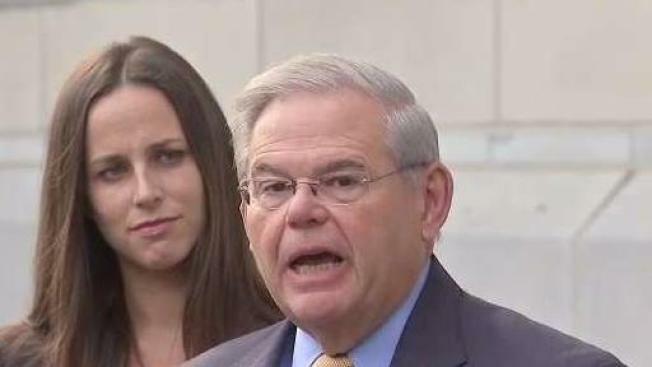 The two were indicted in 2015 and face multiple fraud and bribery charges in a case that could threaten Menendez's political career and potentially the makeup of a deeply divided U.S. Senate if he's convicted. Both men have pleaded not guilty. Menendez said before entering the courthouse Wednesday: "Not once have I dishonored my public office." In his opening statement Wednesday, Abbe Lowell, an attorney representing Menendez, told jurors that the government has no evidence of a bribery arrangement between his client and Melgen. Lowell said Menendez was doing "what 535 members of Congress do all the time" in meeting with government officials on policy issues. Lowell told jurors that Menendez's meetings with executive branch officials could have benefited Melgen's interests but that they were focused on future policy. But the prosecution described Menendez pressuring government officials to help Melgen with securing visas for his foreign girlfriends, a lucrative port security contract in the Dominican Republic and a multimillion-dollar Medicare dispute. Individually and through his company, Melgen also contributed hundreds of thousands of dollars to Menendez's legal defense fund and entities that supported his re-election. 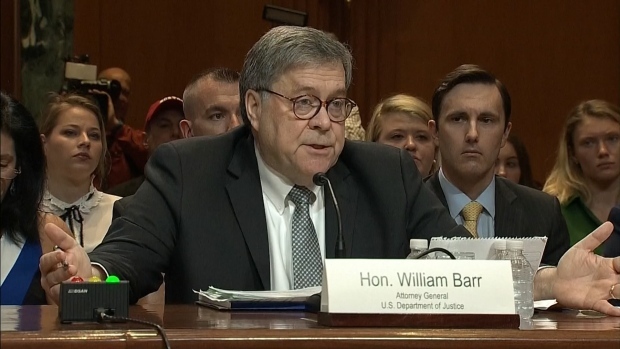 "He went to bat when Dr. Melgen asked, and Dr. Melgen asked frequently," said Koski, who discounted defense lawyers' contention in court filings that the trips were innocent gifts between friends. "There's no friendship exception to bribery. There's no friendship exception to breaking the law." Defense lawyers say that the trips were examples of friends vacationing together, that most of Melgen's contributions went to committees Menendez didn't control and that he didn't control the people he lobbied on Melgen's behalf. Sen. Robert Menendez cannot change the schedule of his corruption trial so he can attend Senate business in Washington, the judge overseeing his federal bribery case said. Jonathan Dienst reports. 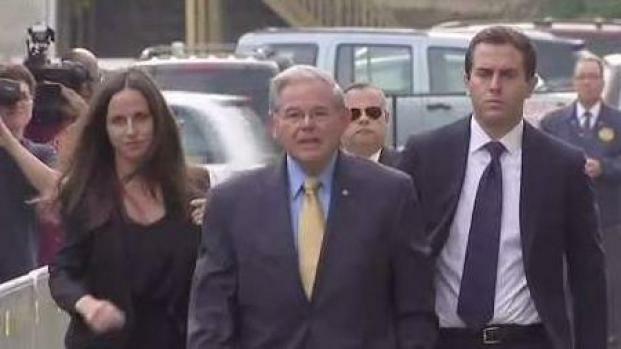 Flanked by his two adult children and at times choking back tears, Menendez said outside court Wednesday: "I started my public career fighting corruption — that's how I started — and I have always acted in accordance with the law. "And I believe when all the facts are known, I will be vindicated," Menendez said. Menendez is up for re-election next year. If he is convicted and steps down or is forced out of the Senate by a two-thirds majority vote before Gov. Chris Christie leaves office Jan. 16, the Republican governor would pick a successor. A Democrat has a large polling and financial advantage in November's election to replace Christie. Menendez said he plans to be at the trial daily but will decide whether to return to Washington to cast votes in the Senate based on the issue and whether his vote could make a difference. The judge last week ruled against an attempt by Menendez to pause the trial on days when important Senate votes were scheduled. Republican Ted Stevens of Alaska was the last sitting U.S. senator to go on trial. His conviction was overturned after a Justice Department investigation concluded prosecutors had committed misconduct. Democrats in New Jersey, including junior U.S. Sen. Cory Booker, have stood by Menendez. Booker was in court on Wednesday to support him. But Koski said, "Melgen gave Menendez access to a life that reads like a travel brochure for the rich and famous." Among the gifts prosecutors allege Melgen gave Menendez were flights on Melgen's private jet, vacations at Melgen's private villa in the Dominican Republic frequented by celebrities like Beyonce and Jay Z, and a three-night stay at a luxury Paris hotel valued at nearly $5,000. The senator "was such a frequent passenger" on the jet that "one pilot stock(ed) the kitchen with (Menendez's) favorite bottled water," Koski said. Along with picking three more jurors needed before opening statements could begin Wednesday, the morning featured some sparring between attorneys for Menendez and Judge William Walls. Attorney Ray Brown accused Walls of disparaging Menendez in his opinion denying Menendez's motion to postpone the trial on days of important Senate votes. Walls continually interrupted to deny the allegation. Attorney Abbe Lowell, frustrated that motions were not being granted in the defense's favor, argued the court was making decisions simply to, "catch the eye of the fourth estate," referring to the press. At one point, Walls even said, "Shut up." Walls chided defense attorneys for filing a motion on what to include in jury instructions at the end of the trial. When attorney Lowell pointed out that the motion was filed according to the judge's order from December, Walls replied, "Fine. Bill me."